Ricciardo, Zoraide’s persistent and ingenious suitor, comes to the rescue and saves her by devious means. Some of the most brilliant writing of the 19th century is found in the nine operas Rossini wrote for the Teatro san Carlo in Naples. Ricciardo e Zoraide is the fifth of these, written in 1818. 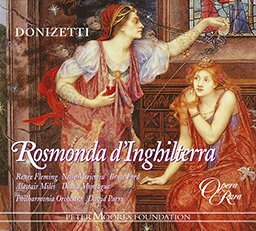 In the opera, Ricciardo, Zoraide’s persistent and ingenious suitor, comes to the rescue and saves her by devious means. Bruce Ford and William Matteuzzi recreate their spectacular tenor partnership of the 1990 Rossini Opera Festival revival. 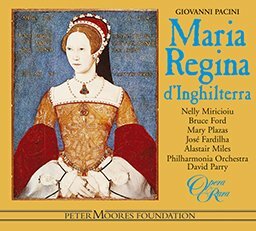 Nelly Miricioiu, Della Jones and Alastair Miles complete a starry cast. 05 Ricciardo e Zoraide: Act I scena II: Quai grida! ? 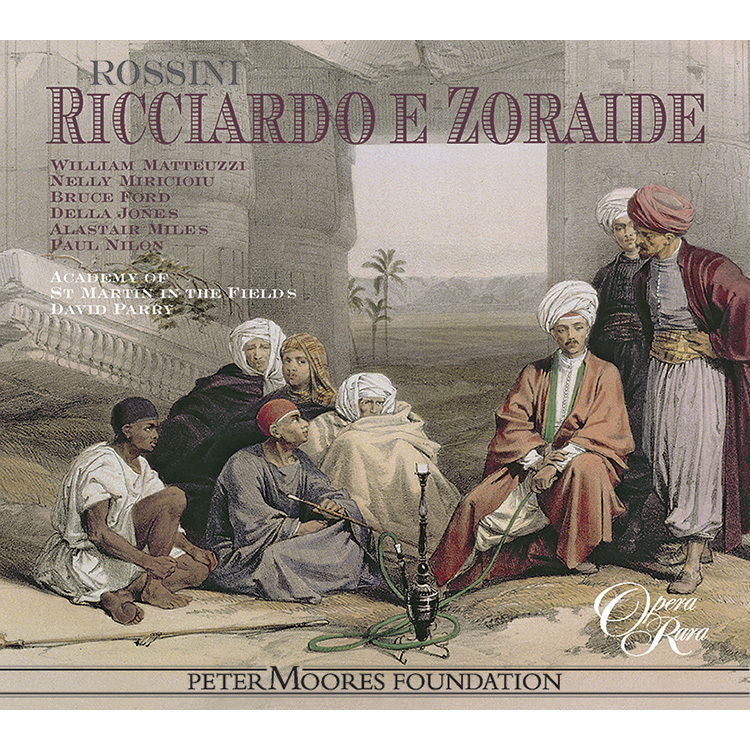 07 Ricciardo e Zoraide: Act I scena IV: Recitative: Zoraide, e qui ten’ stai? 09 Ricciardo e Zoraide: Act I scena IV: Che smania e mai questa! 11 Ricciardo e Zoraide: Act I scena V: Trio: Cruda sorte! 12 Ricciardo e Zoraide: Act I scena V: Dungue ingrata ? 13 Ricciardo e Zoraide: Act I scena VI: Che recate? 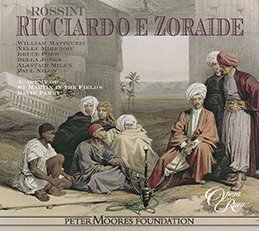 20 Ricciardo e Zoraide: Act I scena XI: Recitative: Scaccia ogni tema dal tuo cor – scena XII: E ancor resisti? 26 Ricciardo e Zoraide: Act II scena III: Recitative: Parti ? Che mai faro? – scena IV: Cielo, che veggo! 27 Ricciardo e Zoraide: Act II scena IV: Duet: Ricciardo! ? che veggo? ? 34 Ricciardo e Zoraide: Act II scena VII: Recitative: Un stranier nella Reggia! – scena VIII: Che intesi! ? 38 Ricciardo e Zoraide: Act II scena XIV: Qual giorno, ahime! d’orror! 41 Ricciardo e Zoraide: Act II scena XVI: Per poco ti calma ? Ircano, a prince of Asian origin, had, before the opera begins, established his sway over a small part of Nubia, the kingdom of Agorante. Agorante had at first suffered his presence, but this tolerance had changed to hostility when, applying to Ircano for the hand of his daughter Zoraide in marriage, he had found himself refused. He had resorted to arms and driven Ircano from his states. In the carnage and confusion that followed, a fleeing Zoraide had encountered Ricciardo, the bravest of the Christian paladins warring in Africa, and had fallen in love with him. Swept away by her passions, she had abandoned her father to follow her lover. Ircano, bereft of both daughter and kingdom, had donned a black suit of armour, and, styling himself the Cavalier del Pianto (the Knight of the Tears), had set upon a quest to recover Zoraide. But it was Agorante who had succeeded in overtaking the fugitive lovers: he had captured Zoraide, and sent her back to his capital, Dongala, as his prisoner. A square outside the citadel of Dongala. The populace welcomes home a victorious Agorante. He reports that his capture of Zoraide has unleashed the wrath of the Christian paladins upon him, but sets his enemies at defiance and declares his intention of ruling for the welfare of his people. A room in Agorante’s palace. The women of his harem rejoice to hear the sounds of celebration that herald his return: only Zoraide and her confidante Fatima stand aloof in dismay and bewilderment. Ricciardo, it seems, has managed to send Zoraide a letter, promising to come to her aid, but warning her lest she exacerbate Agorante’s animosity towards her father by openly scorning him, and also putting her on her guard against Zomira, previously Agorante’s favourite wife, but now neglected as a result of his new infatuation. Zomira tries to worm her way into Zoraide’s confidence, but cannot conceal her jealousy when she meets only with prevarication. The situation becomes even more tense when Agorante appears, telling Zomira with all the tact he can that he has no intention of repudiating her, but that henceforth she must be prepared to ‘share his glory’ with Zoraide. He declares his passion for Zoraide, only to feel insulted and frustrated when she fails to respond. Outside the walls of Dongala. The guards and Agorante’s scouts have observed a small craft sailing up the river Nubio towards the city, but feel secure since there is no sign of any large-scale enemy activity. The small boat comes to shore, and Ernesto, the ambassador of the Christian camp, disembarks accompanied by an African guide who is really Ricciardo in disguise. Ernesto expresses his concern lest Ricciardo betray himself: both Agorante and Ircano are in pursuit of him, and he is too well-known to escape detection for long. Ricciardo is not to be deterred: accompanying Ernesto is his only way of penetrating Dongala and so finding and rescuing Zoraide. Together they enter the city. A room in the palace. Zomira sets her confidante Elmira to spy upon Zoraide. Elmira assures her that all her followers will eagerly aid her cause. Agorante receives Ernesto and Ricciardo. Ernesto demands the restitution of Zoraide and the soldiers who were captured with her. Agorante is willing enough to surrender the soldiers, but not Zoraide. He declares that Ernesto will receive a formal reply within moments, when Zoraide herself is present. Agorante’s throne room. Before his assembled court, Agorante again offers Zoraide his heart, hand and throne, though he follows his declaration with a threat of cruelty should she refuse. Zoraide continues to prevaricate, so that Ernesto and Ricciardo, when the enter, find a situation already uneasy and ready to burst into open dissension. Agorante formally refuses to hand over Zoraide, and Ernesto prepares to leave, interpreting this refusal as a declaration of warfare. At this moment Zomira enters, hoping to assert her rights, but her intrusion serves only to exasperate Agorante even further, so that the act ends upon a scene of heightened confrontation. An atrium in the palace. Zamorre, Agorante’s right-hand man, reports that though Ernesto has left Dongala, his ‘African guide’ has secretly remained behind and now craves an audience. Agorante receives him, and Ricciardo, still in his assumed role, declares that they have both been equally wronged: if Ricciardo stole Zoraide from Agorante, he also carried off his – the African guide’s – wife. He therefore offers himself as the tool of Agorante’s revenge. Agorante accepts his offer, and instructs him to begin by informing Zoraide of Ricciardo’s duplicity. Ricciardo thus finds himself admitted to Zoraide’s presence. Far from promoting Agorante’s interests, as he had promised, he reveals his true identity, and the two lovers are joyfully, if fearfully, reunited. They have, however, been observed by Elmira, who retires to tell her mistress what has transpired. Upon Agorante’s return, Ricciardo, reverting to his role of African guide, tells him that Zoraide now seems more disposed to listen to his suit – but advises him to humble her by pretending indifference. Agorante does his best to comply, but when he declares that he casts her off and sends her back to her Christian lover, he finds that he has gone too far. Zoraide accepts – saying that her father’s love requires her to do so. Agorante realises that he has fallen into a trap, and immediately changes his tune, threatening to cast her into prison. At this moment a knight, clad in black armour and with his visor lowered, appears unnoticed in the background. As a last gesture of magnanimity Agorante refrains from putting Zoraide to death on the spot, and instead offers, if any knight should appear in her defence, to allow her fate to rest on the outcome of a single combat. The unknown knight – who is, of course, Ircano – steps forward and accepts the challenge. All are taken aback. Agorante appoints the African guide as his own champion, and orders that Zoraide be imprisoned while the encounter takes place. Zomira’s spies inform her of these events. She finds it difficult to believe, as Elmira insists, that the African guide is really Ricciardo, but realises that, if it is so, it gives her an opportunity of destroying both the lovers at the same time. Zoraide’s prison. She is visited by Zomira, who offers to help her escape assuring her that she has only one wish; to see her far from Dongala. Ricciardo she reveals, was victorious in the combat, but was promptly recognised, stripped of his disguise and arrested. She nevertheless has it in her power to save both him and Zoraide. Zoraide fass into the trap and hurries away, leaving a gloating Zomira to inform Agorante how his enemies have imposed upon him. A great square. Ricciardo and Zoraide have been captured as they tried to escape, and are now being led to execution. Ircano appears, similarly condemned, and Zoraide begs his forgiveness. Agorante comes to see his orders carried out. Zoraide pleads for her father’s life, but Agorante’s patience is at an end. He declares that Ricciardo will die first: if Zoraide still does not submit, her father’s death will follow. Believing that she has not choice, Zoraide gives him her hand, but insists that he will never have her heart. Such a submission, quite as much defiance as compliance, is too much for Agorante, and he declares that she shall die. At this moment Zomira comes running with the news that the citadel is surprised and betrayed: Dongala has been attacked by Ernesto and his Christian knights. The square rapidly fills with fighting. Agorante’s followers are put to flight, and Agorante himself is overcome and should to be slain be Ernesto, when Ricciardo intervenes to save him. In a gesture of supreme generosity and chivalry, Ricciardo forgives Agorante and returns him his sword. All are suitably impressed. Ircano, convinced that Ricciardo has shown himself worthy of Zoraide, gives him her hand. Agorante also recognises his rival’s magnanimity, repents of his tyranny, and joins in the general rejoicing. Only Zomira is left to contemplate the wreck of all her jealous schemes.